Recently, I read this infographic about avoiding spending traps. Not long after, one of my local stores had Arm and Hammer detergent on sale Buy One, Get One For $0.01. At eye level, they had containers with 35 loads, but on the top shelf, they had containers with 50 loads for the same price — also on sale Buy One, Get One For $0.01. Such a good point, a while back Walgreen’s had on a clearance shelf Clothes Soap for $2.49 (liquid Sun) 75 loads. We were so excited. We bought every jug they had. If you figure it out per load, mega cheap. My kind of deal. 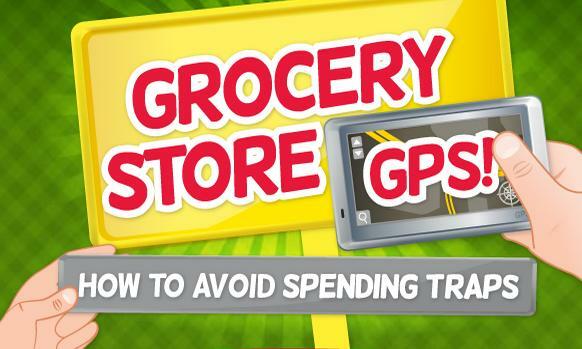 I can certainly use and tips for saving money at the grocery store!! I looked up at the grocery store today and saved 50% off of my organic butter! I keep my butter in the freezer so if I have room I stock up! Sometimes looking below eye level helps too. I can’t tell you how many times I have made my 10 year old reach something on the bottom shelf because it was cheaper. All the sugary cereals are at kid eye level (Danger, Will Robinson! lol). And sometimes the bigger size isn’t cheaper if you look at the unit price. I used to do a lot of “supermarket math” with my son when he was still accompanying me on shopping trips (now I shop while he’s teaching karate; he’s still a savvy shopper). I did a post a while back about similar traps. The stores use lots of tricks to get you to spend more money. I just read in Rachel Ray magazine that the one kind of pre-cut fruit that is often cheaper then buying the whole fruit is watermelon. They went to a bunch of stores to compare prices and found that the whole fruit ends up being more expensive for how much actual fruit you get out of it, because you are also paying for the price of the rind, which constitutes 50% of the weight of the fruit. Very interesting. We don’t buy whole watermelons, because we can never finish one before it spoils. It is better to pay more per pound sometimes than to waste money on food that doesn’t get eaten.